Bass is among two dual enrollment students graduating this fall and an increasing number with the discipline and stamina to handle the rigors of earning an associate degree while in high school. In the spring, 35 dual enrollment graduates earned an A.A. degree, the highest ever. However, not all dual enrollment students complete the degree requirements the semester before their high school graduation and while also pursuing the Honors Gold diploma, the most rigorous track in the Floyd F. Koch Honors College. 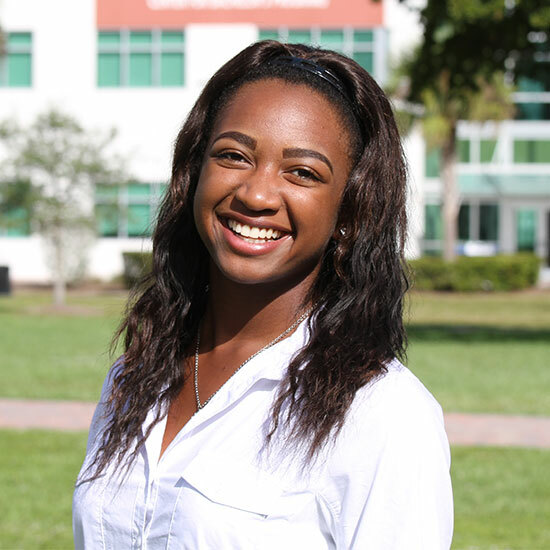 While juggling College and high school, Bass works part time at a shoe store and is actively involved at PBSC in the Phi Theta Kappa Honor Society, Psychology Honor Society and Honors Student Advisory Council where she serves as secretary. She also is captain of the varsity cheerleading team at Seminole Ridge and a member or officer of numerous clubs and organizations. She completed her A.A. degree while facing numerous personal challenges for herself and her family. Bass said her next step is to complete her bachelor’s degree in psychology and neuroscience. She has applied to 11 colleges, including public and private institutions in Florida, as well as several Ivy League schools and is waiting to see where she will land. In the meantime, she plans to take more prerequisites for her bachelor’s program in the spring term before starting her bachelor’s in fall 2019. This is AWESOME!!!! !!!! What an inspiration you are to others!!! Congratulations on your achievements!!! Incredible young lady. One to be very proud of. You are incredible young little girl!! The society needs more students like you. I am proud of you. Praise the Lord God for the great blessing entrusted you to our young generation. Be Blessed! God bless you on your achievements. And always put God first in all you do. Blessings on your new journey…. What an accomplishment! You are disciplined and have a goal. You will be an inspiration to many!!! Incredible…truly an inspiring post. Keep up the great work and enjoy the journey!